Livingston, November 4, 2010: Lenora Agbonze, 42, of Livingston asked a jury for community service and probation rather than prison. Jury Hands Down 25 Years and $10,000 Fine for February Robbery in Livingston, LIVINGSTON, November 5, 2010 - On the afternoon of November 4, 2010, a Polk County Jury handed down a 25 year prison sentence to Lenora Agbonze, 42, of Livingston. Agbonze was convicted one day earlier in District Judge David Wilson's Court for the February robbery of Dollar General Store in Livingston. During the punishment phase, Agbonze took the witness stand and insisted she was innocent, and tearfully asked for probation and/or community service rather than prison. Agbonze was positively identified by the cashier whom Agbonze robbed at gunpoint in the February robbery. Additionally, residents from Agbonze's apartment complex identified her from the store's security camera's that captured her image during execution of the robbery. Agbonze has a history of violence and admitted to breaking another woman's nose in Houston, and has been charged with injury to a child. During the robbery, witnesses said that Agbonze told the cashier at Dollar General; "I'm not playing! I will shoot you!". At a minimum, Agbonze will have to serve half of her sentence (12 and 1/2 years) before she can be considered for parole. Agbonze will serve her prison time in the Texas Department of Corrections. The Polk County District Attorney's Office was pleased with the ruling. Livingston November 4, 2010: Prosecutor Joe Martin (right) looks over at Lenora Agbonze in District Judge David Wilson's Court. Prosecutor Kaycee Jones is also pictured. Livingston Police Department Arrests Dollar General Robbery Suspect, LIVINGSTON, March 2, 2010 - According to detective Ken Bonhert with the Livingston Police Department (LPD), LPD produced still photos from store surveillance cameras from inside Dollar General Store from an armed robbery that occurred on February 4, 2010 located on North Washington in Livingston. Tips from people led police to suspect Lenora Agbonze, 42, of Livingston. LPD made a photo line up and placed it before the robbery victim who pinpointed Agbonze from the lineup.<?xml:namespace prefix = o ns = "urn:schemas-microsoft-com:office:office" /> On March 1, 2010, Agbonze, who had been staying at the Ridgecrest Apartments in Livingston, came to LPD to inquire about why the police department was looking for her. Lenora Agbonze was placed under arrest and charged with aggravated robbery and booked into Polk County jail. See Related Story: Livingston Dollar General Store robbed at gunpoint. 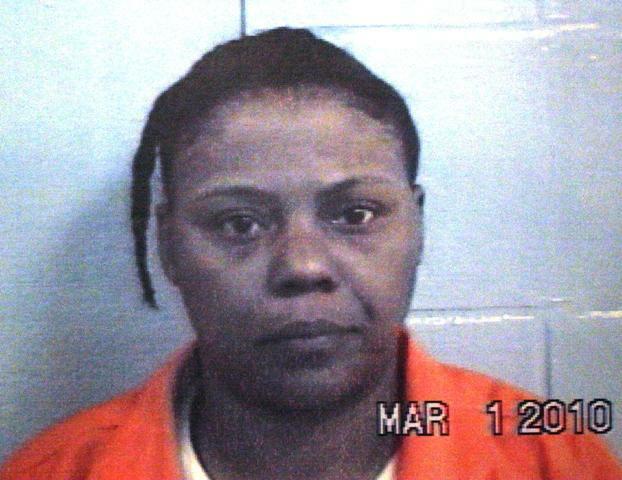 Lenora Agbonze, 42, of Livingston was arrested and charged with aggravated robbery.